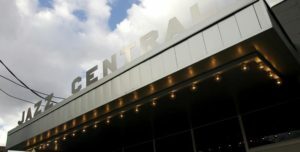 Unique to Central New York, Jazz Central is a 2,300 square feet space that houses CNY Jazz’s offices, a box office, music library, and a 63- to 99-seat theater. Since its opening, Jazz Central has become a regional cultural hub. 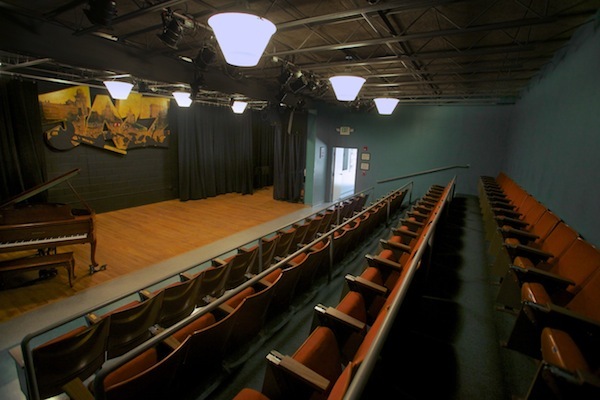 A practice and performance space, it also hosts theater, comedy, film, folk, and private events throughout the year. The facility provides a professional rehearsal space for the CNY Jazz Orchestra and the CNY Jazz’s unique youth orchestra, the Stan Colella Parks and Rec All-Star Big Band (a partnership with the City of Syracuse). The existence of Jazz Central is due to the vision and commitment of CNY Jazz Executive Director Larry Luttinger and New York State Sen. John A. DeFrancisco. Sen. DeFrancisco, a strong patron of the arts, and especially jazz, provided a $250,000 grant from the Strategic Investment Program for the purchase and renovation of 441 E. Washington St. There is no city in the country that can boast a facility dedicated entirely to the pursuit of jazz performance and education aside from Wynton Marsalis’ Jazz at Lincoln Center. We are deeply indebted to Senator John DeFrancisco for his understanding of the value of the jazz art form and his belief in jazz, America’s art form. 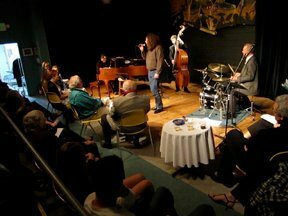 Jazz Central is available for use by individuals or organizations producing public or private events. 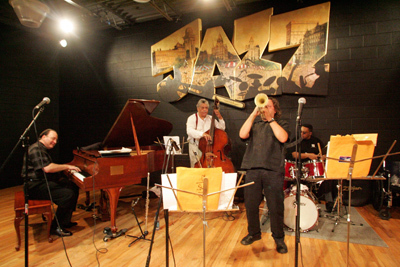 All activities held in the facility must conform to the overall mission and goals of the CNY Jazz Arts Foundation, which may control their content. To request the facility on any date or range of dates, e-mail info@cnyjazz.org writing “Jazz Central Use Request” in the subject line. Describe your program content and schedule in a short, informal proposal in the body of the email. Include your contact information, especially a phone number. Jazz Central is in use almost every night! Please make all requests as far in advance as possible. Jazz Central contains 63 permanent theater seats with optional fold-out lecture hall desk boards. The theater is at grade and is 100% handicap accessible. There is additional cabaret table seating for up to 15. If small presentations allow for ¾ round seating, there is room for an additional row of 12 chairs. Total legal capacity of the theater is 99, including the artists and tech members. There is no direct charge for use of the theater. The public donates a $3.50/admission head charge upon entry. You set ticket prices. CNY Jazz also takes 20% of any merchandise sales. A non-refundable $105 per performance deposit is necessary. The $105 covers the $3.50 admission charge for the first 30 entries. For all private events, fundraisers, etc. usage charges are negotiated. It is your responsibility to promote your event. We will send your press release to our list of more than 1200 e-mail addresses prior to your performance date. If you provide us information on your event two weeks prior to your event, we will post your event on our calendar. We do not offer box-office services. Provide us a contact number for ticket sales and reservations. You may use our grand piano and house audio and lighting free of charge. Piano tuning is your responsibility. We can provide contact information for local tuners. We have available a sound and light board. You must provide sound and/or lighting technicians. In the event you do not have a technical person, we reserve the right to assign a technician at an addition cost to the producer. Microphones/stands, music stands, stools, folding tables, etc. are available on upon request at no additional cost. A Front of House charge of $45 per performance is due with all contracts. Bar service must be arranged in advance (minimum 2 weeks notice) and will include, beer, wine soda, bottled water and food items. Products will be sold starting a maximum of one hour before performances and during intermissions of up to 20 minutes, unless otherwise arranged. The Front of House charge will be assessed whether you use the bar service or not. Although we strongly encourage both local and touring jazz musicians to use our facility, our facility is not a nightclub and does not provide fees to touring artists.